AVRUSBBoot is a bootloader for the Atmel AVR controllers. It uses a firmware-only USB driver to transfer binary data from the PC to the flash of the controller. Once the AVR is flashed with the bootloader, no other ISP programmer is needed; then the microcontroller can be reprogrammed over USB. Software works under multiple platforms. Linux, Mac OS X and Windows are tested. No special USB controllers or smd components are needed. Define the condition when the bootloader should be started, e.g. 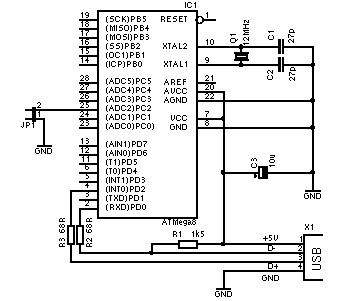 if a special pin is put to ground with a jumper, and the initialisation of the hardware. Define the used data line pins. You have to adapt USB_CFG_IOPORT, USB_CFG_DMINUS_BIT and USB_CFG_DPLUS_BIT to your hardware. The rest should be left unchanged. The bootloader firmware has to be written to the controller with a ISP programmer. Once the bootloader is flashed, you don't need a programmer and you can download the binary data over USB. Don't forget to set the fuses for the external clock source when flashing the bootloader for the first time! A C++ tool for downloading hex files is provided. To compile the program, you need libusb.